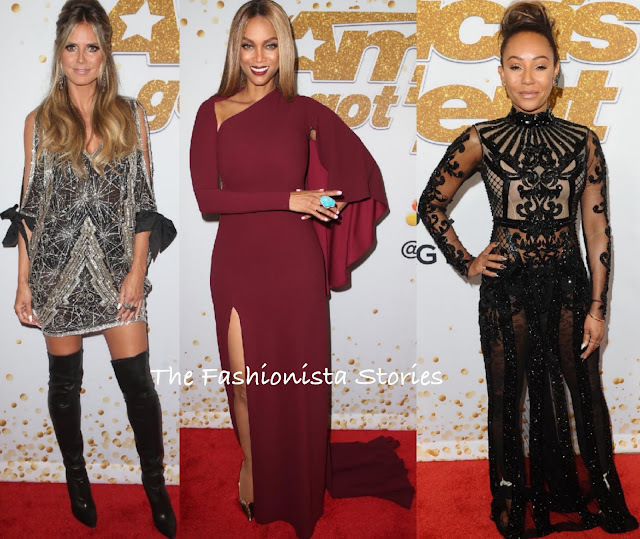 Last night(August 21st) Heidi Klum, Tyra Banks and Mel B was back on the red carpet for the America's Got Talent Season 13 Live Show at The Dolby Theatre in LA. Heidi Klum stepped out in a NAEEM KHAN FALL 2018 silver & gold sequin tulle mini dress, featuring a black underlining for coverage, a v-neckline, split sleeves and black satin tie cuffs. Heidi had the neckline shorten which worked in her favor. While I like the dress, it's her matronly hairstyle that's distracting. Tyra Banks tends to wear pieces that are questionable but I have to say, she is selling this MARC BOUWER burgundy cape sleeve floor length. Her dress which featured an asymmetrical neckline and split, was accessorized with a turquoise ring and metallic pumps. However a ankle strap sandal could have elevated this look. Mel B probably wears the most questionable looks of them all. This ELIE MADI sheer black long sleeve beaded, floor length dress is giving me deja vu.